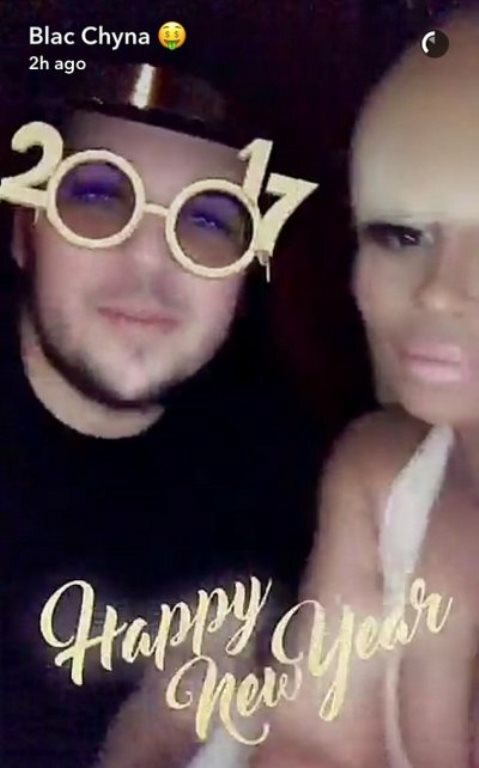 Los Angeles, CA, United States (4E) – Blac Chyna and Rob Kardashian celebrated New Year’s Eve together after he suffered from a diabetes health scare and she recently left their home due to a relationship drama. Kardashian has been posting Snapchat videos on his account and this marked his first appearance since his health scare. In the videos, Kardashian wore his usual black shirt and a baseball cap. Chyna , on the other hand, wore a plunging halter top gown with a sheer skirt. She also rocked long platinum blond wig. He posted videos of Chyna and at one point, he was also seen in the video greeting everyone a Happy New Year using the 2017 filter. In another video posted by Chyna , they were blowing into blow horns while they were at a table that had shrimp cocktail and strawberries. It was not clear if they spent New Year’s Eve at the home of Kardashian or at the home of Chyna . In the photos and videos the couple have been posting, Chyna was also seen sporting her engagement ring so that probably means that the two are still getting married. There are no other details about their wedding. The video posting comes weeks after the Instagram of Chyna was hacked and direct messages from her friends were exposed online. She took their baby, Dream Renee Kardashian , with her and cleared out the baby’s nursery. They reunited days after and he apologized to her online. The uploading is also the first time that the two have updated their fans and followers about the status of their relationship. They did not attend the annual Christmas party of his mother, Kris Jenner , but he visited them the next day.